Community information sessions will be held at the Kulick Community Center (1201 Livernois) at 11am and 6pm on Thursday, April 26tth. Details will include construction timing, staging, temporary parking solutions, and overall plans. Why is this project happening now? The Livernois resurfacing is a Federally funded project and has been scheduled a number of years in advance. The road surface is also deteriorating enough that new resurfacing is needed. While newly striped bike lanes, striped on-street parking, and safer pedestrian crossings are a benefit of the project, resurfacing the street is the primary goal of the project. What is the project area? Livernois, between 8 Mile Road and W. Nine Mile Road. The Livernois and W. Nine Mile intersection will also be reconfigured with a new mast arm signal. How will construction affect the road during the estimated time frame? Construction efforts will be staggered/phased so that only one section is being fully disrupted at any given time. There will always be a minimum of one lane open in each direction on Livernois, but on-street parking will be temporarily removed. How will the City assist businesses during construction? The City will be holding construction update meetings as needed and providing information through email. There will also be designated parking spaces at the Kulick Community Center (1201 Livernois) for business employees and customers to "park and walk" to businesses. Wayfinding signage and shareable materials will be created and shared as necessary. Staff is exploring additional temporary parking solutions in advance of construction. If you would like to stay informed regarding the project, please sign up for updates by emailing ced@ferndalemi.gov. Would removing bike lanes add more on-street parking? No, in the current bike lane configuration and the new protected bike lane configuration, additional on-street parking would not be added. 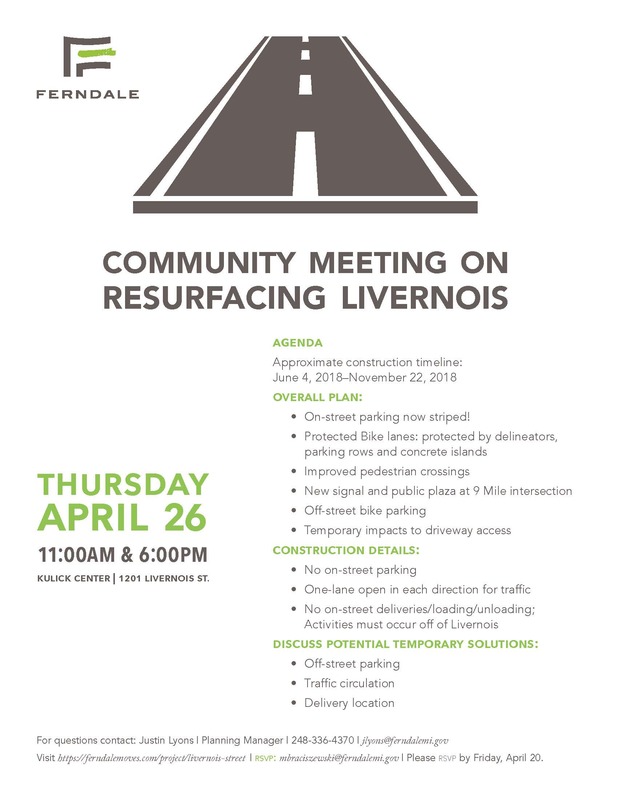 The current parking areas on Livernois are existing, non-conforming and do not have the appropriate distance from driveways and corners required in new parking areas. However, on-street parking areas will be better striped for intersection visibility and to limit parking that happens in conflict with driveways. Why do we want protected bike lanes? Protected bike lanes provide a safer street for everyone and have been shown to increase ridership on streets where protected infrastructure has been installed. Separation from automobiles prevents potential collisions with vehicles (including "dooring"), limits automobiles from parking or loading in the bike lane, shortens crossing distances for pedestrians, and acts as traffic calming to limit vehicle speeds. For more information, click here. How will the protected bike lanes be maintained in the winter? DPW has equipment that will be used to clear snow and ice from protected bike lanes. The bike lanes were planned in partnership with DPW to be sure plows could fit between protected areas and the curb. Will bike parking areas still be in the street? Bike parking will be moved off-street in greenbelt and other public area to provide ample bike parking closer to businesses and limit potential conflicts with automobiles and bikes. Review draft engineered drawings of the draft Livernois resurfacing plans at this link.